The HHP Dolphin 9500 portable data terminal features a powerful and rugged design, allowing it to perform in the harshest of climates. Its IP64 sealing specification protects the Dolphin 9500 from any dust or sprays of water, and the unit itself can perform in temperatures as cold as -20 degrees fahrenheit. 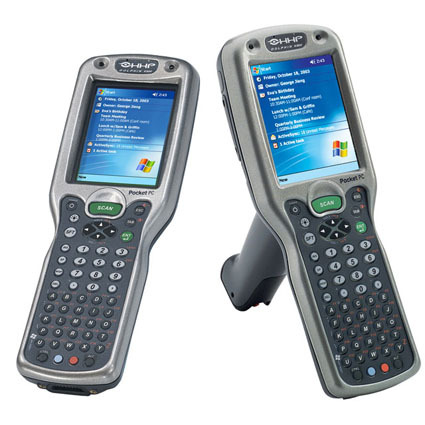 For maximum speed, efficiency, and usability, the HHP Dolphin 9500 comes equipped with the Intel X-Scale processor and the Microsoft (R) Pocket PC platform. Supporting an industry leading integrated triple-radio design with wireless WAN, LAN, and PAN the HHP Dolphin 9500 allows real-time data collection and anywhere, anytime information access. Dolphin 9500 Kits are available as standard options. These kits include the charging cradle, power supply and USB cable. Dimensions (W x D x H): 3.45" x 1.66" x 9.6"
Decode Range: 2.5" to 12.5"